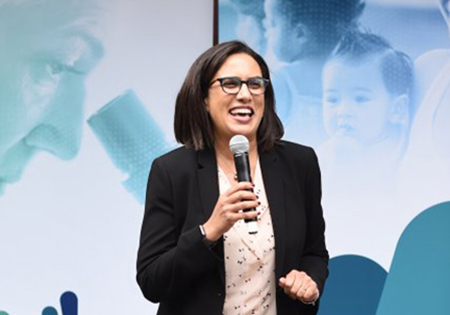 "What I am excited about is the opportunity to talk to leaders in the health system, in education and in research, and weave these strands together." 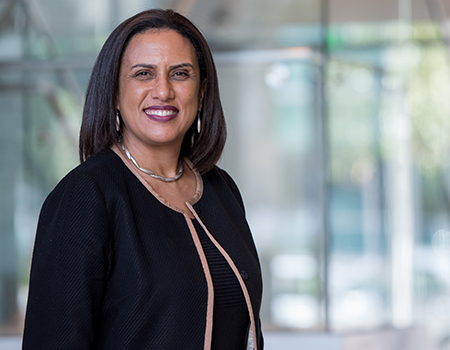 Dr. Bibbins-Domingo was recently appointed as the inaugural vice dean for Population Health and Health Equity, in addition to being named chair of the Department of Epidemiology and Biostatistics. In this Q & A, she responds to questions she has been asked since the announcement. Population health looks at patterns of disease and health in groups of individuals. These groups can be defined in a number of ways - by where we live (the Bay Area for example), by where we work (UCSF), or by other demographic factors, such as socioeconomic status, race and ethnicity, or disability. Because health programs and policies often affect groups of individuals, we need to understand the factors that influence the health of these groups to design effective interventions. 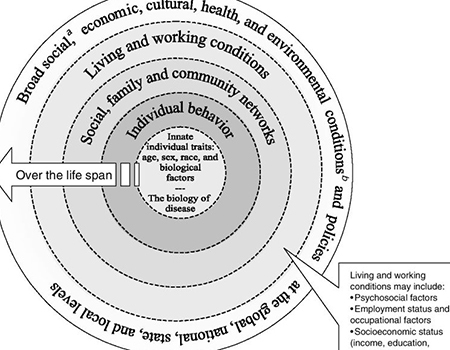 Figure from "Understanding Population Health and Its Determinants"
How does this work relate to other initiatives at UCSF that appear more focused on the individual, such as Precision Medicine? These approaches are complementary. To truly create the targeted therapies that precision medicine promises, we have to also understand how social, environmental, and behavioral factors influence the health of populations and intersect with individual biology. Advancements in data analysis and integration have made precision therapeutics possible. These same advances can be used to target preventive efforts more effectively to specific populations. UCSF has been a leader in this broader vision of precision medicine. We were fortunate to host a national discussion on the topic of Precision Public Health, sponsored by the White House and the Bill and Melinda Gates Foundation. How does this tie in with the “health equity” part of your new role? Health equity means that everyone has the opportunity to lead the healthiest life possible. To achieve this goal means understanding and addressing obstacles to good health that affect different communities, including factors like poverty or discrimination. When we look at the patterns of health and disease in a population, we see certain groups that have worse health outcomes. The concept of health equity emphasizes that we need to understand what leads to poor health outcomes in those groups and then tailor our interventions accordingly. What do you see as the core responsibility of this new vice dean position? We are already doing amazing work at UCSF related to population health and health equity, work that is nationally recognized but could be more broadly known in the community. Part of my new position is to help shine a light on all that is being done here at UCSF already. But I want to think bigger. I would like us to expand our work in population health and health equity across all of our missions at UCSF - in research, education, clinical care, and service. I want to identify areas of new opportunities, new synergies, and new partnerships, so that we can magnify our impact. Many of our scientists, clinicians, and educators are interested in making their work more accessible. I want to make it easier for them to identify partners with the right expertise. What I am also excited about is the opportunity to talk to leaders in the health system, in education and in research, and weave these strands together. By creating this new role, Dean King and his leadership team are reinforcing our commitment and making it more visible to our external partners.This creates an important opportunity to nurture our community partnerships and those with policy makers, and at other institutions. How will this be integrated with your role as new chair of Epidemiology? The Department of Epidemiology and Biostatistics is the “methods hub,” where faculty are engaged in developing the very tools and methods we need to advance the fields of population health and health equity. So the two roles are well aligned. The department is also involved in many other types of collaborations, teaching, and mentoring, and I am very much looking forward to working with others to enhance our impact in those areas. Is your role with the Center for Vulnerable Populations going to change? Once a new director of CVP is named, I will step down from my directing role, but I will still be involved on the executive committee. Clinically, I will also still be based at Zuckerberg General Hospital. My heart is really there. I see much opportunity for the CVP’s continued growth and advancement of the critical health equity work that the center is doing on that campus.